Back down the mountain, for the second time, the field looked as though we might see Julie Andrews spinning and singing off in the distance. I must not have been the only person on the bus to make the connection, because from somewhere behind me, I heard someone ask, “Dr. Wiles, can we go frolic?” That was the exact word used: frolic. The Glee Club’s tour to Germany and Austria in 2012 was my first international tour at the university. To be honest, it was my first real international tour. I had travelled with ensembles prior to this trip as a singer and as a conductor. I had even played major roles in coordinating international tours while in college. But this was the first time I had taken an ensemble with my big-boy job. I’ve never felt older than when I was taking myself too seriously as a thirty-two year old with a big-boy job. I didn’t feel like a young man, though I still looked young. My early days at the university were filled with janitors eyeing me suspiciously when I’d stay in the building to work late at night, student caterers refusing to serve me alcohol, and the never ending litany of “I thought you were a student” offered by students and colleagues alike. My young appearance and lack of experience made for an interesting relationship with the guys of the Glee Club. Though a class, Glee Club was inherently different from their lecture courses, so they tried to place upon me a relationship other than “professor.” Not quite old enough to be their father. Not quite young enough to be their friend. In the early days at the university there was a distinct “older brother” relationship. I don’t know if it was the right relationship. But that’s what it was. At the same time, life is maddening when you believe you aren’t being taken seriously. I had worked for years to get my big-boy job and believed I deserved a certain amount of deference and respect. When my youth, rather than my self-declared expertise, was more openly acknowledged, I could become haughty and defensive. In an effort to distinguish myself, I even grew a ridiculous horseshoe mustache for tour. Too often my inner life is made visible by my facial hair. The multiple trips up and down the mountain (backwards and forwards) had made me a little nauseous, so I was happy to get off the bus. “Sure. Go frolic,” I said. The guys needed no more encouragement. They bounded off the bus like a herd of puppies who see a tennis ball launched into the air. I didn’t know what they meant by “frolic.” As it happens, they meant exactly that. They galloped and skipped with loud, marcato guffaws, arms raised in the air as if their own youth was something they could simply unleash upon the world. It was irreverent and beautiful. 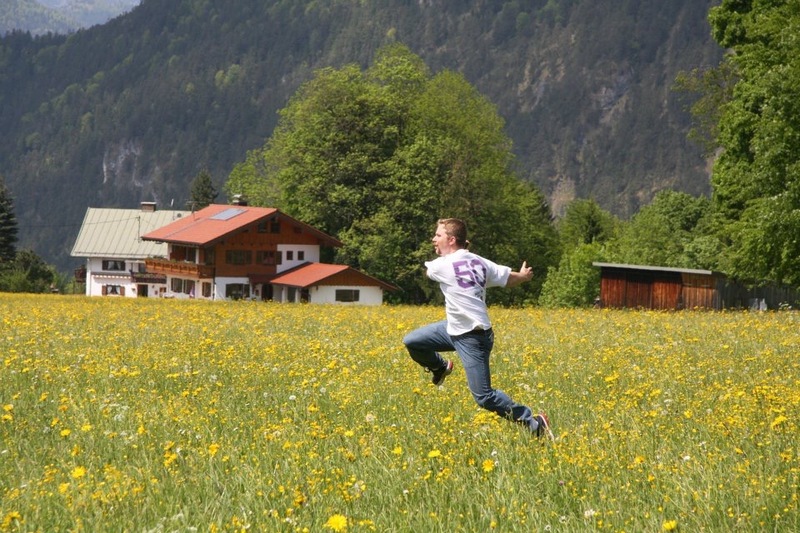 Somehow I screwed the courage to dart into the field and leap into the air. I stopped worrying about my own dignity, my big-boy job, my 7 habits of highly effective people, and most shockingly, my appearance. I ran in circles, waved my arms, and roared. Collectively we cheered for each other and took a group picture with hearts racing before getting back on the bus, leaving the field of flowers and revelry behind. Looking back, I think I was invited to join the dance because the guys reflected the call of my inner self. Too much had been hidden by the adoption of responsibilities, title, and mustache. I could not fill any role for the students if I was unable to fill the role of simply being and becoming. Like R.S. Thomas’ pilgrimage to Bardsey Island, running into the field was running to my own self. This is not to say that I’ve successfully completed the Jungian Individuation process or that I can even understand how to untangle my intuition from reason. But I know I was a better musician and teacher when I decided to get off the bus and let go of my competing notions of who I was supposed to be. Today, allowing myself to romp in the field is a moment-to-moment quandary, whether I’m in the rehearsal hall, on stage, or within the sacred confines of my own home.